Dave is an enigmatic individual, who draws worship whereve he sets foot. Now, on your knees and worship the glory of Dave. Now, on your knees and worship the glory of Dave. Ok, Dave, thanks for the link. Looks like a pretty logical setup, though I'm not sure on one thing- What's the holds layer for? The only purpose that occoured to me was to use it as a selection tool- i.e. when painting on your colors layer, you comand click (or whatever it is on a Mac) the holds layer to keep things tidy on the colors layer. Is that right? Also, MBirkhofer gave me a great improv scanned lineart setup tut. MBirkhofer wrote: Scan in at 300-600dpi greyscale. The specific depends on the res you need. If it isn't being printed, save some disk space, and go 300. Adjust the image with threshold, curves, or brightness/contrast. These will all basically let you adjust the white/grey/blacks of the image. You want to get it to a level where, the lineart looks correct, and not fuzzy with much grey outlines. Convert to color mode, bitmap (a.k.a. Black and white.) Select 50% threshold. This will covert every pixel to either pure black or pure white. Your lineart will look jagged at 100% zoom. This is normal. Dot gain in print, and zooming out on the web will make this invisible. The higher the rez, the less jagged the lines will appear. Now create a duplicate layer of the image. Switch to channels menu. Select, load channel as a selection. Hit delete, which will delete all the white off of the top layer. Deselect. And lock the transparency of the top layer. Your lineart is now on it's own layer and locked. Multiply does not work for print. As it allows the undercolor to show through completely. The black multiplied over a white, is not the same as a black multiplied over a blue. Well, in CYMK anyway. It does in RGB. Again not in print, but it's fine for the web. Someone else will have to give the channel method, as I don't use it. Does this jive with what you do? Is it fairly standard, or at least common? I just tried it, and it looks good to me, but It's not been printed yet, and I want to establish good practices before I get all absorbed in the art. The holds layer is for coloring the linework. If you flip through a comic you'll notice that sometimes the linework is colored on special effects or used for seperation. With Dave's hold layer it is easy to paint over the lines and easy to edit. It doesn't effect the actual linework in the process. Is a "hold" the term for coloring the lineart? Josh wrote: MBirkhofer gave me a great improv scanned lineart setup tut. ...Now create a duplicate layer of the image. Switch to channels menu. Select, load channel as a selection. Hit delete, which will delete all the white off of the top layer. Deselect. And lock the transparency of the top layer. Your lineart is now on it's own layer and locked. Does this jive with what you do? Instead of creating a duplicate layer of the lineart as he does... copy and paste the lineart from the background into a new alpha channel. This way at the very least you have a quick backup of the lines. Then load that infomation from the alpha channel as a selection. You may have to "inverse" to get the selection to represent the lines, but not always. and as MB suggests, set the lines to Darken, not multiply. Josh wrote: Is a "hold" the term for coloring the lineart? yup! Short for "color hold"
Yeah, I use a layer, Dave uses a channel. The channel takes up less space, but I like the ability to manipulate the lineart layer easier. I think I forgot to say switch the image back to RGB or CYMK after you bitmap it., btw. Dave, do you know exactly what "darken" does differantly then "multiply"? Oh, and yeah the method I gave does not include trapping. As Dave pointed out. I currently do that after. As my method for coloring the lineart or painting, or screening over the lineart, works best with the lineart untrapped. I'm constantly changing my methods, as I'm still learning. There are many ways of doing things. Do what you like best. 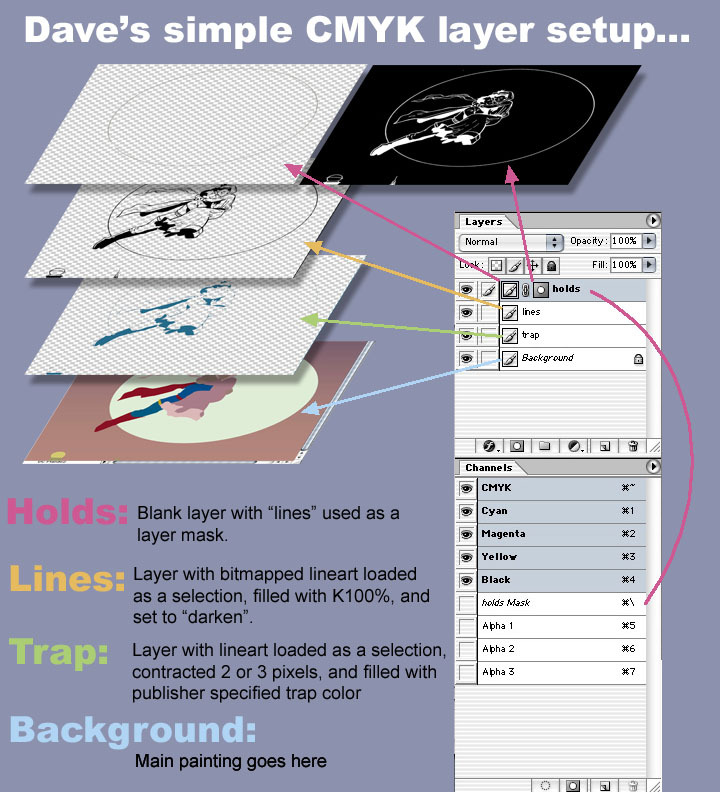 Actually, Dave uses a layer just like you, but he keeps a copy in channels as a back up and to create the lineart layer. I usually do what Dave does for the lineart but I usually don't create the lineart layer till I'm finished. I'm adopting his holds method though, so now I'm using the layer from the start.